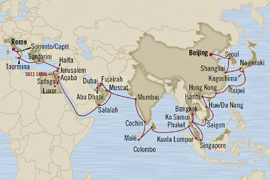 Oceania Cruises Beijing to Rome Pagodas and Sultans 71-night Cruise sails from China to Italy following the route of Marco Polo’s spice trading exhibitions between the Far East and Western Europe. To reserve your stateroom fill out the form. Our cruise line representative will get back to you shortly with the best price and free bonus amenities.